This week, I'm posting my recipe separate from my Frugal Food Thursday recipe linkup. You'll see why soon! I was planning on making lemon chicken for dinner one night last week, and I thought: why not use some of the limoncello liqueur instead of lemon juice? It came out delicious, albeit not all that frugal if you have to buy the limoncello. However, if you happen to have one hanging around the house, give it a try! Place chicken breasts in a plastic bag. Using a mallet, pound chicken breasts to 1/4" thickness. Remove from bag. On a plate, mix the flour, garlic powder, salt, and pepper. Dredge the chicken breasts in the flour to coat. In a large skillet with a lid, heat the olive oil over medium heat. Add the sliced onion and cook, stirring, for 3-4 minutes, until onion is translucent. Add garlic cloves and cook, stirring, for another 1-2 minutes. Add the mushrooms and cook for another 1 minute. Remove vegetables from the pan with a slotted spoon, keeping the oil in the pan. Add the chicken breasts. Cook for 3-4 minutes on one side or until breasts start to brown. Flip breasts over and cook on the other side for 3 minutes. Remove chicken breasts from pan. Return vegetables to the pan. Add the limoncello and deglaze the pan. Add chicken broth and bring to a boil. Once boiling, turn the heat down to medium-low, return the chicken breasts to the pan, and cover the pan. Cook on medium-low for 15 minutes. Serve over shells or orecchiette (ear-shaped) pasta to catch all the yummy sauce. Mmmm! I love limoncello to drink... It must be even better to eat! Limoncello is a snap to make, and so much cheaper than buying it. I make it about every 3 months, oh my goodness it is yummy! I am going to have to use it to make this Limoncello Chicken. Thank you for the Limoncello Chicken idea. We will give this one a try Saturday night for sure. Limoncello is a snap to make and cheap too!! I make it every 3 months. I'd never had limoncello until traveling to NOLA this past year and it's definitely something special! I almost always have a bottle of limoncello in the fridge, but I've never used it in savoury dishes. I really like the sound of this lovely recipe! 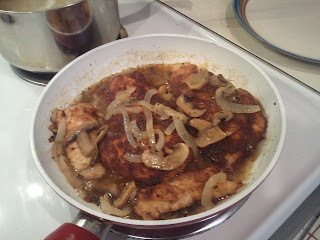 Limoncello chicken looks delicious thanks for shairng with Hearth and Soul blog hop. That sounds delicious! Thanks for sharing with Healthy 2Day Wednesday; come back tomorrow to see if you were featured!